In EV subsystems, insulated-gate bipolar transistors (IGBT) are three-terminal power semiconductor devices commonly used as fast and efficient switches for power electronics applications such as inverters, converters, and power supplies. IGBTs are often combined with diode dies in various topologies to form larger modules that require protection from the peak voltage spikes produced during switching operations. For example, the EV inverter in Figure 2 is responsible for converting DC battery power to three-phase AC power to drive the traction motors during acceleration. It also converts AC power back to DC power during braking. 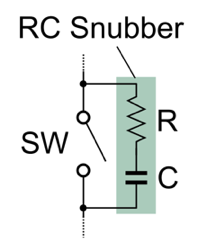 A power module driving a three-phase load will need at least six IGBTs with six accompanying snubber capacitors Csnub to protect the semiconductors. We recommend using our 600V-2kV nF-µF C0G or X7R capacitors to fit these requirements. The DC voltage ratings for the capacitor will depend on the blocking voltage of the semiconductor switch. The positive temperature coefficient (PTC) heater controller is another EV subsystem that requires snubber capacitors. Unlike petroleum-based cars that can warm the cabin using the combustion engine’s waste heat, EVs use high-voltage PTC heaters as the heat source in the heating, ventilation, and air conditioning (HVAC) system. PTC heaters utilize specialized materials that, when cold, have lower electrical resistance, allowing full current to flow and heat to be generated. As the temperature increases, the resistance of the PTC material also increases. This property acts as an automatic safety feature that limits the current flow and prevents overheating. The power supply unit (PSU) circuitry in the heater controller requires high-voltage capacitors for snubbering and for primary-secondary isolation purposes. Common capacitors for this use case include our 1206-3640 1kV-2kV 1nF-1µF X7R. Given that IGBTs and power modules are found everywhere in EVs, it’s critical for designers to select the right high-voltage snubber capacitor that meets the application requirements and industry certifications. For more information, contact us to discuss your project needs, or download our technical white paper Considerations for Selecting Automotive-Grade Multilayer Ceramic Capacitors in Electric Vehicles.